I adore matte lipsticks! I love how they look on, and most of the time I find them to be longer wearing and amazing in colour. Even more so I'm getting into the world of liquid lipsticks which is quickly becoming a huge trend in the beauty world. Well, from what I've seen at least. 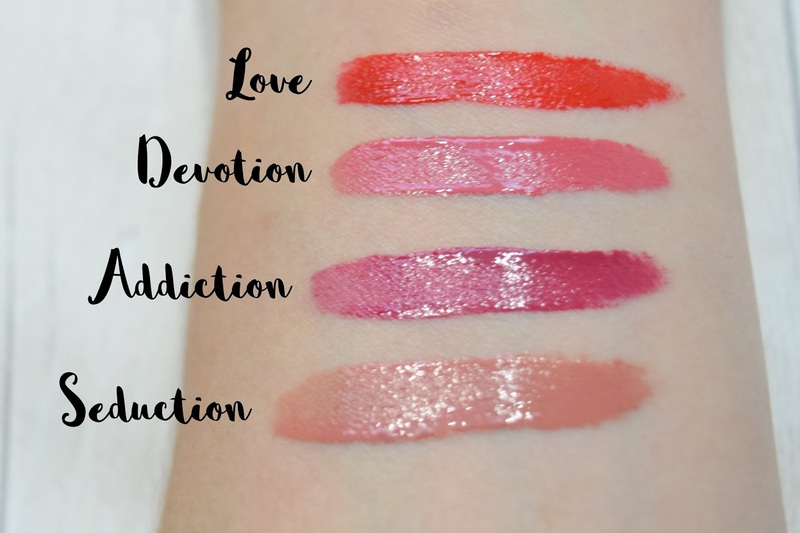 Recently I discovered the Ultra HD Matte Lipcolors by Revlon and because I've been using them so much recently I thought I could talk about each of them and share my thoughts! Next up is a lovely pink colour called 'Devotion'. It's quite a natural pink colour and dried matte it has a dusky feel to it. I don't know if it's with particular make up looks I've been doing that it looks duskier, but it works and I like it. The staying power with Devotion is good too, but I wouldn't rate it as well as Love just because it does wear a little easier as the day goes on. It is less noticeable when it does wear though as it's quite a natural pink and works well with my natural lip colour. I often find it difficult to find a lighter pink shade that compliments my skin tone that isn't a bright or darker pink, but I think this one works quite well. What do you think? This next colour is 'Addiction'. In the packaging it looks more like a dark pink-purple shade but when I applied it for the first time on my lips, I felt it looked more like a bright(ish) dark pink. Does that make sense? I definitely expected this colour to look a lot darker on the lips from my first impression and I was a little disappointed when I first applied it but nevertheless this is a great colour. I've grown to love it as found I wear it more often than I expected to actually! Just like Love I find this colour wears quite well with little need to touch up often but I do find that it isn't as kiss-proof as my favourite red. It's also a great matte alternative to a lipstick I have with a satin finish in a similar colour from MAC's Archie's Girl Collection called Daddy's Little Girl. I think they're very similar at least. In conclusion, despite a couple of bumps in terms of colour and opacity I absolutely love these matte lip colours by Revlon. I love that they are almost all kiss-proof, they dry perfectly matte and their staying power is better than I expected. A great addition to my lipstick collection and I would love to grab the other 3 available in the UK to finish up my collection of them at some time. I really hope they bring out more colours here too, as I've seen they've got some amazing darker shades and red shades I'd love to try out. Have you tried the Revlon Ultra HD Matte Lipcolors yet? What colour is your favourite? I love a matte lipstick too! I'm not a fan of glosses/normal lipsticks as they come off almost instantly for someone like me who NEVER shuts up. I'm definitely adding these to my shopping wishlist! Thanks! !